Well hello October! This is the month that we get to finally meet our baby boy! 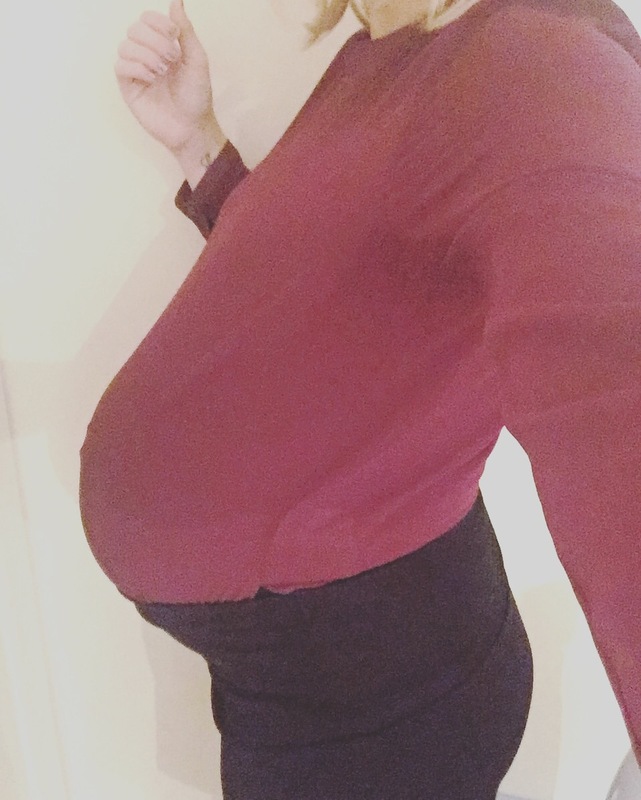 So I’ve been considered at ‘term’ for a week today and in that week I won’t lie, I have had several trips to co-op for reduced fresh pineapple chunks and spicy curry ready meals… My braxton hicks have continued to be strong and often, but never increasing or becoming regular enough to signal the real thing. I’m getting very tired of being pregnant now as I think most people do at this stage. I’m tired all the time, I can’t get comfortable in any position and I need to pee every single night without fail. I know that baby will come when he’s ready blah, blah, blah, but it doesn’t make the last couple of weeks any easier to cope with. Two Sundays ago it was my baby shower and I got so many lovely gifts from friends and family. You can read the post on the shower here. Last Tuesday I went to a mothercare event and bought the last few bits we needed. I also picked up a Moses basket as the one I had from Carly wasn’t in the best condition. This is now set up and ready in our bedroom, making everything seem a little more real! I’m still at work for another week and I am seriously counting down the days now. I won’t lie, working up until 39 weeks was a bad decision, one that I’m definitely regretting. I’ve taken my last Saturday off as I just can’t face doing show rounds a few days before I finish, this means I now have 4 actual days left at work, which sounds just about bearable! 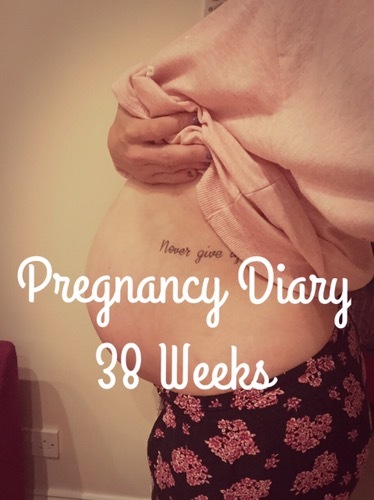 On the evening I finish work next week, when I’ll be exactly 39 weeks, I’ve booked in to have reflexology done, something I credit for starting off my labour with Carly at 3 days overdue, so fingers crossed it’ll have the same effect and this baby will get moving. If not at least I’ll have finished work and only have a week left to go until full term by that point. My birth pool was delivered last week but we haven’t gotten around to inflating it just yet, mainly because the kids will get in it if we do. Last weekend Ed and I went on a shopping trip and got all the last minute bits for the planned home birth (think tonnes of flannels, some very attractive blue tarpaulin and crushed ice for me to add to my water). I’ve also printed off some birth affirmations and a sign for the front door. I now have an emergency hospital bag ready in the car at all times with my notes, and a box full of things for my home birth should all go to plan. The past week has been incredibly stressful after we were informed that the roofing work we’ve been having done was going to take a further four weeks (so wouldn’t be done until the end of the month when it should have finished last week). I went a little crazy about it all but have calmed down a little, although it’s still nowhere near ideal to have scaffolding up and builders hanging around when I’m due any day. 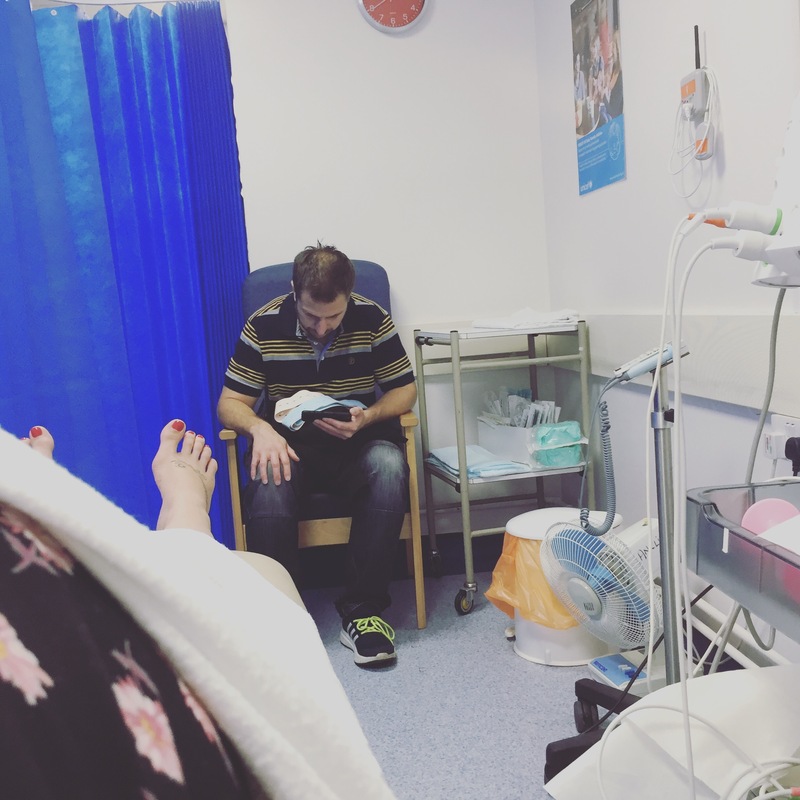 I feel I can’t relax in my own home (not ideal when planning a home birth!) and I’m dreading maternity leave in a way as I won’t be able to rest with constant banging and shouting above me. Work has almost been an escape for me! We were told by the builder today it may be finished a little earlier than they anticipated and a tentative date of next Friday has been given, cue Ed telling me I must cross my legs until at least then (no thanks, I would rather give birth in a building site than wait longer than necessary to hold this baby boy in my arms). I’m sure whenever he decides to make his appearance we’ll cope with whatever stage the work is at and go with it. I just hope we have a proper roof over our heads for the sake of our newborn baby being nice and snug and warm! Food wise I don’t feel I’m craving anything in particular although I am definitely greedier lately and eat anything and everything in sight! I feel I’m almost making the most of feeling I can eat what I want before baby arrives and I have to try and be more sensible again. 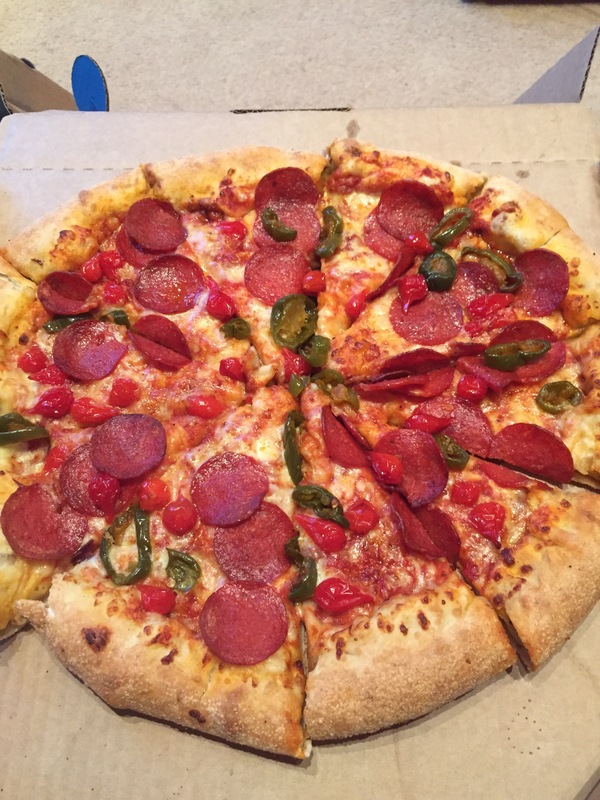 I get so hungry after work at around 2.30 and again a couple of hours after dinner. I can’t eat ice cream at night anymore without getting awful heartburn so I’ll be looking forward to having this as a rare treat when baby arrives, I do love my Ben n Jerrys! 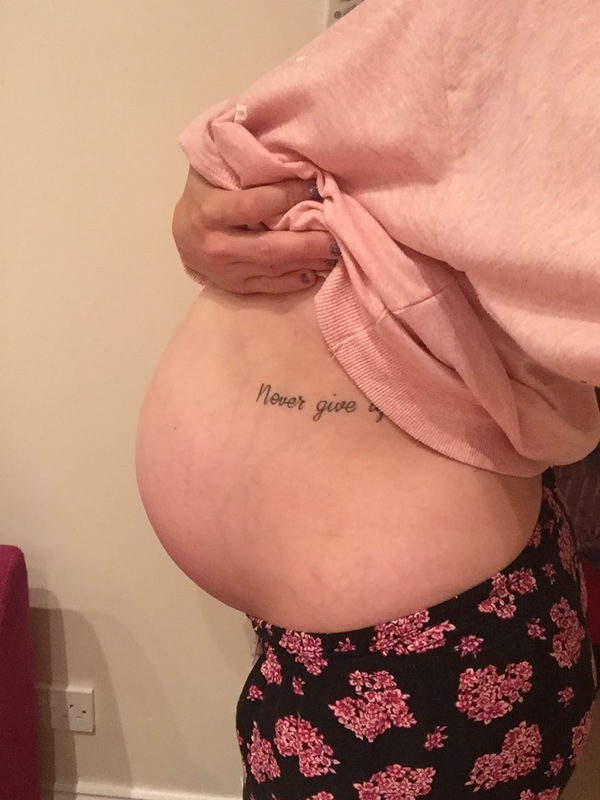 My belly visibly dropped a few days ago and now looks smaller than it did a couple of weeks ago. The baby’s head is most definitely engaged as I can feel him very low down and it’s almost difficult to pee now. I had to go in to the maternity unit again last Thursday as I was having awful headaches and hadn’t felt baby move much. I was hooked up to the monitor and low and behold he moved again. Better to be safe than sorry though. The midwife was also convinced my waters might have slowly been going so I was tested for this but it came back negative. I have my 38 week appointment with my midwife tomorrow morning. I’m wondering if I’ll be offered a sweep at this appointment as I know some people suggest this. I know they didn’t work for me in previous pregnancies but you never know and if offered I’m sure I won’t turn it down. This weekend I plan to rest as much as possible before my final two days at work next week and then once I’ve finished, if no baby is in sight yet I will be trying to relax and make the most of a few days off without either of the kids around before baby arrives and things become a lot more stressful.